Our company stocks the product in mass. Thus, we can cater to bulk/retail requirements with easy and ensure fast delivery of a product. Quality packing material and advanced machines are responsible for the safe packaging of the orders from our end. Moreover, our experts keep a strict vigil on the entire procedure. 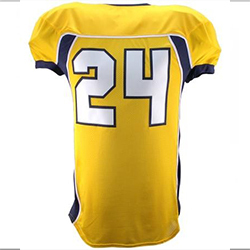 WB-1602 American Football Uniform has a soft fabric lining with a regular fit design and high durability.